V1.0.2.24 - Improved the download methodology to limit risk of missing data. (Most often a problem on older PC's). Added selectable y-axis on altitude graph display. Added ability to display one or both of speed and altitude graphs at the same time in the profie display. Changed the .klm export to enable the additional functionality found in Google Earth v4.2 and above. Added ability to display multiple documents in the analysis screen. 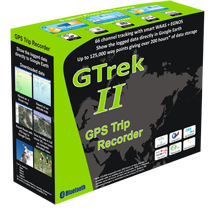 V1.0.3.0 - Released with GTrek II only. This code WILL NOT work with any earlier GTrek, Ski-Log devices. V1.0.4.6 - Minor bug fixes, G-forces display on Track version, Mods to route rotation, Single click to download data, improved "Trim" utility, added "Delete Inactive Data" utility. V1.0.4.15 - Minor bug fixes, multiple file display on Track version, fix error in vertical assent calculation, additional functionality in the "Configure GTrek" page, Update for Win 7 campatibility, download speed increased. V5.0.0 - A major overhawl and the inclusion of Virtual tours via integrated Google Earth. V5.0.13 - First general update release November 2010.